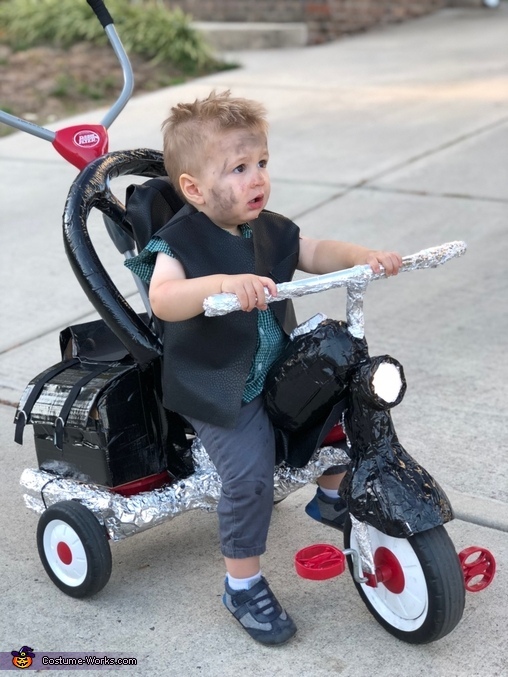 Our son loves riding on his trike around the neighborhood and he also loves motorcycles, so we thought it would be fun to create a costume for him based on transforming his trike into a motorcycle. We thought, “who is our favorite motorcycle riding character”, and the answer was hands down Daryl Dixon from The Walking Dead! Much of this costume was “winging-it” style, by covering his trike with tin foil and black duct tape. We used Daryl’s actual bike as an example and added a gas tank (football-shaped dog toy wrapped in duct tape), a muffler (foam tube from the hardware store wrapped in tin foil), saddlebags (cardboard boxes cutout and covered in duct tape and hooks), and a headlight (push-light covered in tin foil and duct tape). We also created a “cross-bow” just like Daryl’s using more foam tubing, wood, shoelace and lots of duct tape. We covered his seat and the “backseat” with fabric “pleather”, which was also used to make his vest. Dad joined in, got messy, and put in red contacts to play the role of zombie. We all had a lot of fun with the costume, and although the little guy isn’t allowed to watch The Walking Dead just yet, we think he played the part perfectly.